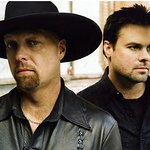 Montgomery Gentry is a country music duo composed of vocalists Eddie Montgomery and Troy Gentry. 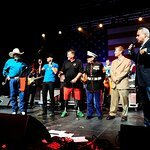 Eddie Montgomery and Troy Gentry devote their time and energy into making the needs of others a priority. They are active participants in any charitable organizations they support giving their time, talent and treasure. Together, they have strongly served and supported the U.S. military and numerous charitable organizations including the TJ Martell Foundation, which Troy serves as a board member. They also provide their individual time to two deserving philanthropies. Eddie gives his support to Camp Horsin’ Around in Lexington, Ky., which provides a camp facility equipped for children with serious, chronic illnesses and physical difficulties. Troy bolsters the Make-A-Wish Foundation of Middle Tennessee. Google trends for "Montgomery Gentry"
We don't have any videos related to Montgomery Gentry.